A few weeks ago I posted to commemorate the poet-theologian St Ephraim the Syrian; St Ephraim shares his feast, 9 June (as celebrated in the West), with St Columba, as it turns out. St Columba was my first Saint of the Week when I was still on top of that — I even revisited him. 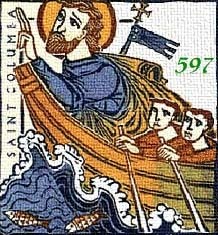 In that first post, I discussed St Columba the missionary; in the second, St Columba the wonderworker (Columba Thaumaturgus?). We must not forget St Columba the poet, a mode I highlighted in the first of those posts when I quoted from his hymn, ‘Adiutor Laborantium’. That poem is a plea from ‘a little man / trembling and most wretched, / rowing through the infinite storm / of this age’, that Christ might save him and bring to paradise, to the unending hymn (trans. Thomas Owen Clancy and Gilbert Markus, Iona: The Earliest Poetry of a Celtic Monastery). Here we see angels doing as they are meant — praising God. Satan, on the other hand, seduces ‘our firstborn parents, both of them’ (7.2), and suffers a second fall. Up to Stanza 8, this is like a small, early mediaeval Paradise Lost. Now, Columba moves on to the fierce power and potential violence of God’s created world, exemplified by the Deluge. But, although the world could be deluged at any time, God keeps creation regulated. I imagine that a life lived in the Western Isles of Scotland makes one think of the power and ferocity of rain and wind. If this is ‘Celtic’ ‘panentheism’, it is much more like the ‘panentheism’ of Kallistos Ware in The Orthodox Way, where the acknowledgement of God being everywhere in creation is not a limitation of God but simply the recognition of His transcendent yet immanent Self; that is, God is not in creation in a nature-god sort of way. He is everywhere, Almighty, sustaining all things by His power. We can find Him anywhere, with or without ‘Thin Places’. Take heed Stanza 14 — St Columba believed in a round earth!! Christ is King. There is Tree of Life imagery earlier. He judges the world. But where is the Crucifixion? The fear of Hell and hope of Heaven, yes. But we move straight from Moses to the Day of Judgement. Nonetheless, there is so much of value in this Irish, this ‘Celtic’, poem of the Early Middle Ages, written in Latin by a missionary abbot on an isle in the Hebrides. I wonder if life in the Hebrides makes one more acutely aware of the Day of Judgement? There is sound theology, beautiful imagery, and a good amount of secular learning — knowledge (scientia) of the natural — created — world is a fitting place to extol the Creator. ‘Altus Prosator’ is an abecedarius; each stanza begins with a different letter of the Latin alphabet, from A-Z in 23 stanzas (lacking from our viewpoint: J, U, W). It is rhythmic, written in heavy trochees: ‘Altus Prosator, vetustus’. Out on the edge of the world, we can see the united world of Latin culture, visible here in this sixth-century Irish poet and the beauty and theology of his verse.